Enjoy the hearty taste of your favorite breakfast without the carbs or the mess. Sam’s members – Apply for the chance to try Jimmy Dean Delights Egg’wich for free with The Insiders! Complete the form on the linked page to apply for your chance to receive a free Jimmy Dean Delights Egg’wich Package! 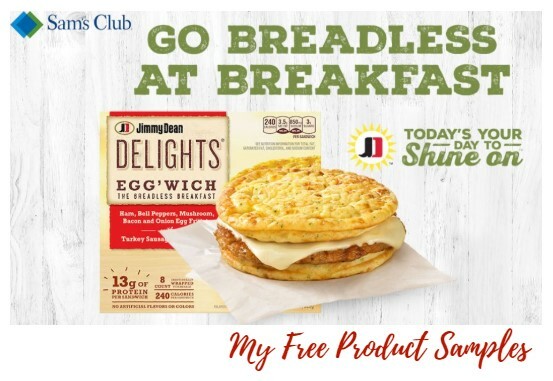 If chosen for The Insiders Jimmy Dean Delights® Egg’wich Campaign, you will have the opportunity to purchase the Ham, Bell Peppers, Mushroom, Bacon and Onion Jimmy Dean Delights® Egg’wich with turkey sausage and cheese and receive a rebate from the Insiders.